As Comarch celebrates 25 years of operation, it’s an appropriate time to take stock of the way the OSS landscape looks today, and the challenges and opportunities that developments can offer communication service providers. Comarch teams around the world have seen first-hand just how much OSS requirements and solutions have changed since the days of the 56K modem. Those teams have helped many of our clients implement projects that are designed to meet new demands and be proof against future developments. There are several obvious areas in which operators are seeking to implement solutions to help them optimize operations in the digital era. Automation, in day to day operations and service provisioning, facilitates a zero-touch approach that lets telcos eliminate unnecessary manual activity in the network and react quickly to troubleshooting requirements. There’s also greater focus on customers – and less on the network – as seen by the shift in operation center models from the NOC (network operations center) to the SOC (services operations center) set-up. In line with this, CSPs have become more responsive to customer demands thanks to new ways of modeling services and products via single, central product catalogs in which every element of a service is decomposed into individual elements that can be re-used – granting ultimate flexibility to deliver highly personalized offers. This wouldn’t be easy without virtualization and the introduction of hybrid virtual/physical networks. One thing that really stands out is that digital transformation demands a whole new way of thinking about telcos. CSPs are forced to learn how the old and the new – legacy hardware and virtual software – can operate together. Training, support and re-education are required in order to disseminate new OSS best practices among CSPs and to “sell” new technologies to the public and to operators. Product development is taking a virtualized path, which brings with it new approaches such as devOps, and new OSS platform architecture. And CSPs are being driven to innovate, exploring, for example, ways in which machine learning and predictive analytics can be deployed to further automate and speed up services and underpin assurance. Of course, in many cases the legacy model simply isn’t sufficient to handle new services and keep up with customer demand, but operators now understand that there is still a place for older technology. For example, it’s worth remembering that 5G is still at a relatively early stage, meaning that even 2G is useful in terms of IoT microservices and as a solution in isolated areas in which 5G has not yet been deployed. Let’s look at two ways in which the theory behind these changes can be put into practice. 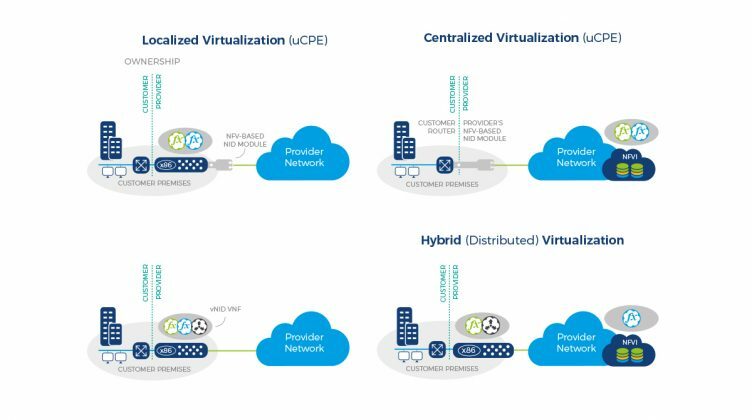 First, universal customer premises equipment (uCPE) is now being used to manage virtual and physical network elements, because it’s a way to cut out expensive proprietary devices that were required by legacy set-ups. In this way, CSPs can optimize customer site deployments quickly and easily, by deploying virtual network functions (VNF) on a universal platform in place of the older equipment. Such a solution is flexible and scalable, and yields the best results when all proprietary extensions and specialized hardware are discarded. Second, the arrival of 5G means telcos have to utilize their virtual and software-based OSS capabilities to the maximum extent. It’s too early in the game to talk about an immediate switch from fully physical to fully virtual, but we can say that 5G cloud RAN (C-RAN) and physical network infrastructure are going to be interacting and co-existing for some time. Thus, operators are focusing on how to manage resources in such a model, which is necessary because network inventory systems need to be as dynamic as the self-configuring network they describe. In conclusion, it can be said that the key to success in the new digital world is a willingness and ability to understand and adapt to new technologies, and to take full advantage of the opportunities for innovation that they offer. At Comarch, we’ve seen many changes over the past 25 years, all of them challenging and sometimes difficult. We remain committed today, as always, to meet those changes head-on, and to continue working to our strengths as we help our customers prepare for the future. Passionate about telecommunications and sports, Pablo has been working with Comarch for longer than four years, as OSS Consultant. He graduated as a computer engineer in Madrid and is now based in Chile, where he supports sales and helps Comarch to grow across the whole Latin America region. He believes team-work, spirit and client-focus are essential skills for achieving goals.